Awesome, Awestruck, Breathtaking, Colorful, Fascinating, Spectacular, Outstanding "Olympics Ceremony!" I guess all these adjectives could very soon turn out to be cliché when someone describe the opening day of 2008 Summer Olympics. When Li Nang was lifted from the ground and suspended in the air, there was a huge surprise waiting for the entire world. His 'marathon' run towards the Olympic Cauldron "in the mid air" along the upper wall of the Bird's Nest stadium will go down in the Olympic history as one of the most exciting moment. Fireworks that followed the moment he lit the Olympic Cauldron almost sent chills down my spine. I was thrilled and left in the oblivion for some time. Take a look at those spectacular pictures of Olympics Flame Lighting Ceremony. Series of events during Olympics opening ceremony have won the hearts of millions around the world. Synchronized presentation of 2008 Fou drummers, Contemporary dance on a backdrop of a giant paper scroll, Giant scroll transforms into a fluid array of movable type blocks, Chinese opera, Rising royal dragon pillars, and many more performances were just beyond my imagination. This is something i will remember for the rest of my life. It was an absolute treat to watch the opening ceremony of 2008 Summer Olympics. Check out some of those colorful images of the 'Big day in Beijing' here. The number 'eight' in Chinese culture is associated with prosperity and confidence. “8″ means “Fa” (发) or “Prosper”. "It is not easy to meet with such a date, hopefully this lucky day will bring luck!" said Wang Wei, secretary general of Beijing Organizing Committee, in the opening ceremony. Organizers choose the date and time, all coinciding with 8. i.e. 8th second of the 8th minute of the 8th hour of the 8th day of the 8th month (August) of the 8th year in the millennium (08:08:08 08/08/2008). The Beijing Olympics live broadcast started at 08:08:08 in the morning of August 8th 2008 (US EST). Olympic Organizers issued 800 yuan ($110) ticket for the opening show. There were 2008 Fou drummers staged a synchronized presentation. There were 2008 martial arts fighters dressed in white, opera singers and dancers wowed the cheering crowd, which included dozens of heads of state. To drill the civility rules into every family, China has distributed four million booklets to homes in Beijing. The 109-page booklet gives dozens of recommendations on what to wear and how to behave in social situations, the workplace, the family, the street and meetings with foreigners. Here are some very interesting "dos and don'ts" recommended in the booklet, (some of you may hate this list, but Chinese have decided to showcase themselves in a much bigger way, no matter what. Appreciate their efforts if you can). Don't wear white socks with black leather shoes. Shake hands for only three seconds. Maintain eye contact for 30 to 60 per cent of the conversation. "If you look too long at the face of the person you are talking to, it suggests that you have more interest in the person than the subject," the booklet says! Don't wear more than three colours in your clothing. Avoid wearing damaged stockings because it is indecent (for women). Thick-legged women should wear dark stockings, while thinner ones should wear light stockings. Avoid exposing the edge of the stockings outside the skirt. For men, it recommends dark-coloured socks and careful co-ordination of their clothes. It advises people of both sexes to avoid wearing pyjamas and slippers in public — a traditional outfit that is sometimes seen among Beijing's elderly residents in their late-night walks in their neighbourhoods. In taxis, women should avoid sitting in the middle if they are sharing the back seat with two men. And above all, booklet says, "please stop spitting." Found it ridiculously interesting? Read More. The mascots are Beibei the fish, Jingjing the panda, Huanhuan the Olympic flame, Yingying the Tibetan antelope and Nini the swallow. When the first syllable of each of the five names are said together, the result is the phrase Bìijîng huânyíng ni which means “Beijing welcomes you”. The official logo of the games, titled “Dancing Beijing,” features a stylized calligraphic character jîng (+©, meaning capital), referencing the host city. In the opening ceremony, over 15,000 musicians, acrobats, trapeze artists and other performers in lavish costumes staged a celebration of China's history which focused on its key inventions – the compass, gunpowder, paper and printing. The center of the stadium was transformed into a constantly unfurling electronic scroll, showing Chinese script and the typewriter. 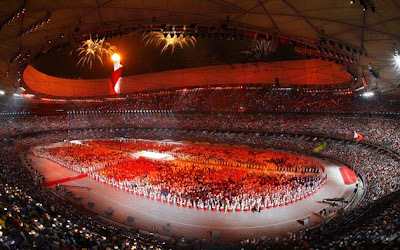 The spectacular opening ceremony was masterminded by Oscar-nominated filmmaker Zhang Yimou. Some things which may raise your eyebrow! More than 110,000 security personnel were patrolling the Chinese capital where anti-missile barriers have been erected for the Bird's Nest stadium, the most expensive in Olympic history. Four satellites are taking cloud images every 15 minutes, while 186 automated weather stations around the city gathering data every five minutes. Seven fixed Doppler radar stations and two mobile radar stations are also deployed. Earlier, under the hazy skies, the final hours of the Olympic torch relay started in the morning at Zhoukoudian, a UNESCO heritage site in southwestern suburb, which has yielded many archaeological discoveries, including the remains of early human relative Peking Man dating to between 250,000 and 450,000 years. These statistics may interest you. There will be 28 sports at the Beijing games. 10,708 athletes from around the world will be competing. 5600 press journalists and photographers have been accredited for the games. 12,000 television broadcast staff have been accredited. 70,000 volunteers will help the events run smoothly. 2008 Beijing Olympics is undoubtedly (going to be) "The Best" Olympics in the history. Olympics is not just a sports event, It's a biggest festival to celebrate sports, It's a conglomeration of cultures and nationalities crossing the language barrier, above all it's an important platform for building world peace as the vision of 'One World, One Dream' calls upon the world to unite in the Olympic spirit. Enjoy and celebrate the spirit of Olympics! Official 2008 Beijing Olympics site. Beijing Olympics on You Tube. Add google 2008 Beijing Olympics gadget in iGoogle. Olympics 2008 on google maps.